The All-Star Dad Baseball lets Dad know where he stands in the latest polls! 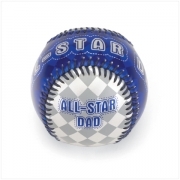 This baseball makes a great gift for every Dad on your list. Personalize it by having his little sluggers autograph the ball for a truly special keepsake!